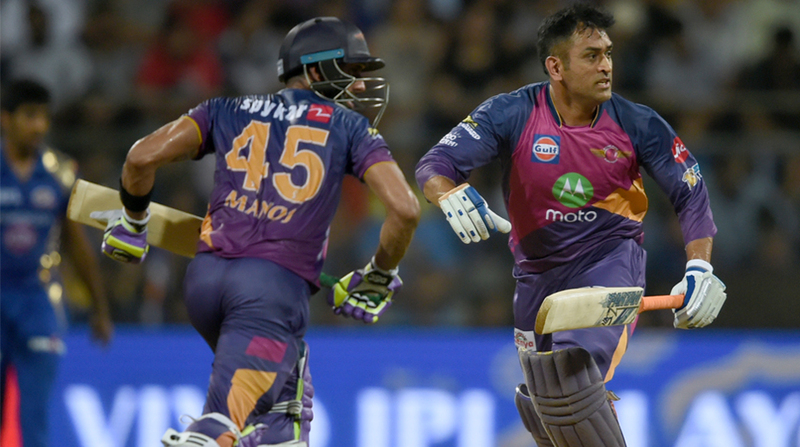 Seasoned Bengal cricketer Manoj Tiwary hailed charismatic Mahendra Singh Dhoni for providing the much-needed impetus to the Rising Pune Supergiant innings that proved decisive in the outcome of the Qualifier 1 against Mumbai Indians. Dhoni smashed five sixes in his 40-run knock that propelled Supergiant to 162-4. Supergiant reached the final with a 20-run win. "The momentum shifted during the last two overs. We were struggling to get that until the 18th, 19th and 20th over where Mahi bhai played some outstanding shots. It was not easy against Bumrah, but he showed why he is such a highly-talented player," said Tiwary who played a crucial knock of 58 in 48 balls before being run out. "He has so much of ability to hit the best bowlers in the IPL. Those sixes in the crucial overs helped us to put up a good total," said Tiwary who also put on 73 runs with Dhoni for the fourth wicket. Tiwary said captain Steve Smith and coach Stephen Fleming told him and Ajinkya Rahane during the strategic time-out that a score of 160 was reachable. "Our bowlers executed the plans very well. They lost a couple of wickets in the Powerplay and we never looked back from thereon," added Tiwary referring to rookie bowler Washington Sunder s three-wicket haul, two of which were in one over, which stymied MI s run-chase. Sundar grabbed the wickets of two-time title winners captain Rohit Sharma, Ambati Rayudu and Kieron Pollard in his second and third overs to finish with 3 for 16 and walk away with the man of the match award, the youngest to do so in IPL history. Tiwary said his role in the team was well-defined, go in early and steady the ship if early wickets fall or bat lower down if a partnership gets built early on. "My role was like if couple of wickets fall in Powerplay, then I have to go. If a partnership builds then I had to come down because (England all rounder) Ben Stokes was there. MS bhai was there. So, mentally I was prepared. Before coming to the IPL, I had a plan to strike at a very high strike rate. But coming here, I was given this role. "I have always planned myself that I will bat according to the situation. Luckily, everything is coming of well except a couple of bad scores prior to this game. I am happy with the way I have contributed. They have given me the confidence and it helps for a player like me who missed the last IPL due to injury." Tiwary said it has been a team effort even in giving input to Smith, and in this he singled out Dhoni for helping the Australia skipper in setting the right fields. "He (Smith) is doing a good job, but the kind of results that we are getting it cannot be only credited to only one person. Each and every one has played their part whether it is on the field or off the field by giving suggestions to him as he is not from India. He does not completely know the Indian domestic players and other teams as well, so we share our ideas. "Mahi bhai has been supporting very well to him. It is evident on the field that he (Dhoni) has been manoeuvring the field placements and keeping them in the right position while Smith is completely focused on changing the bowlers. He has too much on his plate and that way Mahi bhai is guiding each and every player to stand in the right position."